Shipping: Add item to shopping cart in order to calculate rate. Carlisle 60306 - Baking / Roasting Pan - 8 Qt. From Carlisle, a respected manufacturer of food service products since 1955, comes a durable roasting pan that is suitable for making a variety of meals in your commercial kitchen. This eight quart roasting pan measures 17" wide, 11" deep, and 2-1/4" high, so it's a perfect size you will reach for again and again. 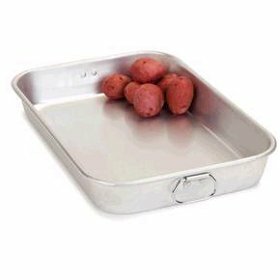 The 21 gauge aluminum pan is the perfect choice for roasting whole turkeys or chickens, roast beef, ham, and other large sized cuts of meats. This pan features durable loop handles that allow you to get a firm grip when removing from the oven.